In an apparent concession, Russia will allow the adoptions of children by American families who finalized their paperwork before January 1, 2013. Russian children whose adoption by American families has been approved by a Russian court will be allowed to join their prospective adoptive parents, despite the fact that a ban on Americans adopting Russian children came into force January 1, President Vladimir Putin’s spokesman Dmitry Peskov said Thursday. “In cases where certain legal procedures haven’t been finalized, a total ban on adoptions by American parents will be applied,” Peskov told Dozhd TV, a liberal online TV station, less than three days ahead of a major opposition rally in Moscow that will protest the adoption ban. The adoption ban was passed by lawmakers speedily late last year in retaliation for the U.S. passing the Magnitsky Act, which blacklists Russians implicated in the death of lawyer Sergei Magnitsky in a Moscow pre-trial detention center in 2009. Magnitsky had exposed a fraudulent tax rebate scheme through which law enforcement officers allegedly siphoned off at least $230 million from Russia’s state budget but were never prosecuted. Peskov’s comments appeared to overrule an earlier statement made by the Kremlin’s Commissioner for Children’s Rights, Pavel Astakhov, in late December. Astakhov told the Interfax news agency that 46 children cleared to join their new American families would stay in Russia after the adoption ban came into force. 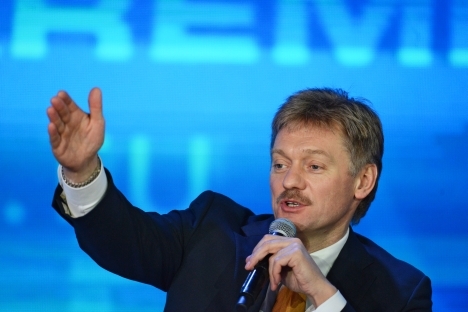 Peskov’s statement also came a day after Russia’s Foreign Ministry emphasized that the adoption agreement with the U.S., which had taken effect as recently on November 1, 2012, would not be revived. Meanwhile, the pro-Kremlin United Russia party, which has a majority in Russia’s lower house of parliament, the State Duma, plans to introduce a bill banning virtually all foreign adoptions, excepting only France and Italy, with which Russia has existing bilateral agreements. The bill will be introduced “in a week or two,” the Itar-Tass news agency cited the bill’s sponsor, Yevgeny Fyodorov, as saying Thursday. “[The bill holds that] the export of children can be carried out only in the countries that Russia has bilateral agreements with. There are two such countries now – France and Italy,” Fyodorov said. Yet Peskov has said he is not aware of any initiative allegedly put forth by United Russia to ban citizens of all foreign countries from adopting Russian children. The comments by senior officials in Moscow came as Russian media reported that a 14-year-old orphan with a debilitating disease living in the Urals city of Chelyabinsk, Maxim Kargapoltsev, had appealed to President Putin asking him to let an American couple, with whom he has been in touch with for seven years, to adopt him. Kargapoltsev later denied in a video interview with the RIA Novosti news agency that he had made an appeal to Putin. He explained that last December a local journalist contacted the orphanage where he lives to shoot a film about it. While interviewing Maxim, the correspondent asked him what he would ask the president. Three weeks before the adoption ban came into force, Chelyabinsk authorities turned down the American couple’s application to adopt Kargapoltsev, citing mistakes in the papers they submitted. On Thursday, a nationalist State Duma deputy from the Chelyabinsk region, Sergei Vainshtein of the Liberal Democratic Party of Russia, announced that he and his wife were going to become Kargapoltsev’s foster parents, even though the couple had never met him before. “My wife and I have long been considering fostering an orphan, we support several orphanages in the Chelyabinsk region,” Vainshtein was quoted by his party’s press office as saying. The article is based on materials from ITAR-TASS, Kommersant, RIA Novosti, Gazeta.ru, Dozhd TV Channel.